Day 9 and it was our last full day in the motor home. We still had plenty of amazing sights ahead of us. We had to finish off the ‘Golden Circle’ with a visit to the Kerið Crater with its blue water at the bottom, followed by the Thingvellir National Park, where Parliament still sometimes meet, as do the Eurasian and Pacific tectonic plates! 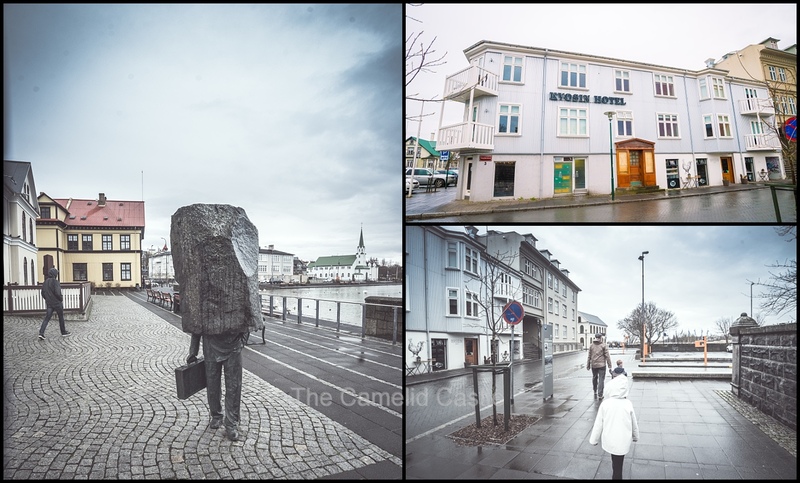 The afternoon was spent in a rainy and cold Reykjavik, before we headed to the comforts of a hotel that was an ex-NATO base to finish our time in Iceland! After a slightly more restful nights sleep (although the wind had picked up again briefly scaring the adults) we slept in til around 7.30am. We were finally doing better with this motor home thing, now we were about to go back to hotels! We started the repacking process and had breakfast of scrambled eggs. It was the official ‘use up everything in the fridge’ day so we ended up with quite a lot of interesting meals! We were pleased to be at least be able to leave the camp site after the bogging experience of the night before. There was still quite a lot of churned up dirt and mud in the camp field which had deterred other campers from trying to same thing……. We spent a little time sorting out the motor home to make it easier later in the day when we returned it. The kids were happy playing outside, pretending to ‘camp’ while we packed. Then we hit the road at around 9.30am. 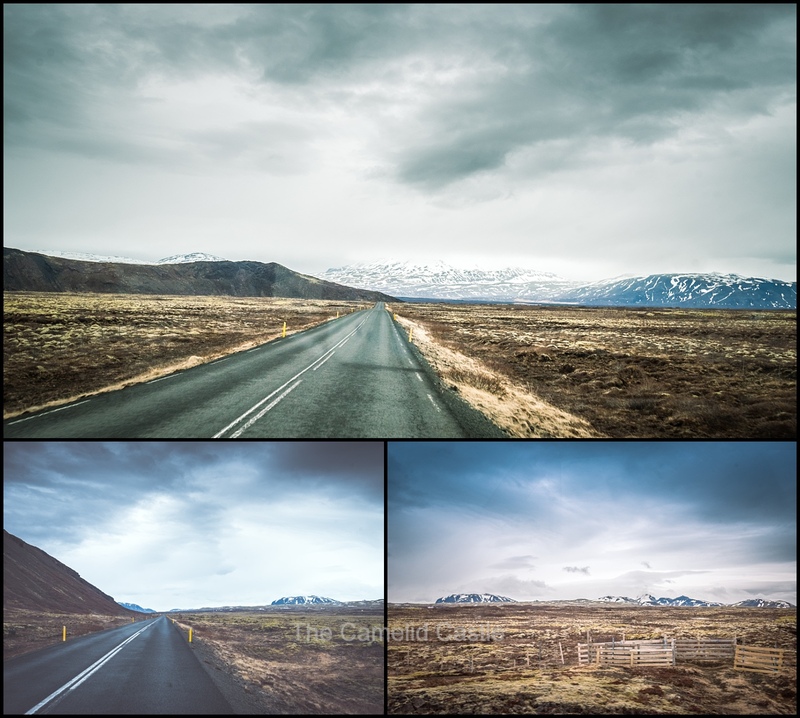 As we were doing the Ring Road around Iceland clockwise, the famous ‘Golden Circle’ tourist area was to be last on our agenda and we were effectively doing it in reverse, ending in Reykjavik. We’d ticked off quite a few of the Golden Circle attractions the previous day, with spectacular waterfalls, the Secret Lagoon and the Geysir. 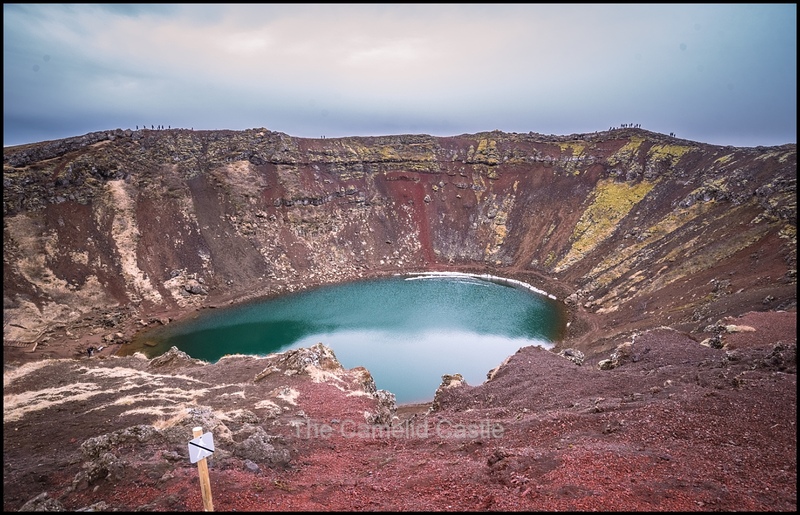 This morning our first stop was to be the Kerið Crater, a volcanic crater lake located in the Grímsnes area in south Iceland, along the Golden Circle. 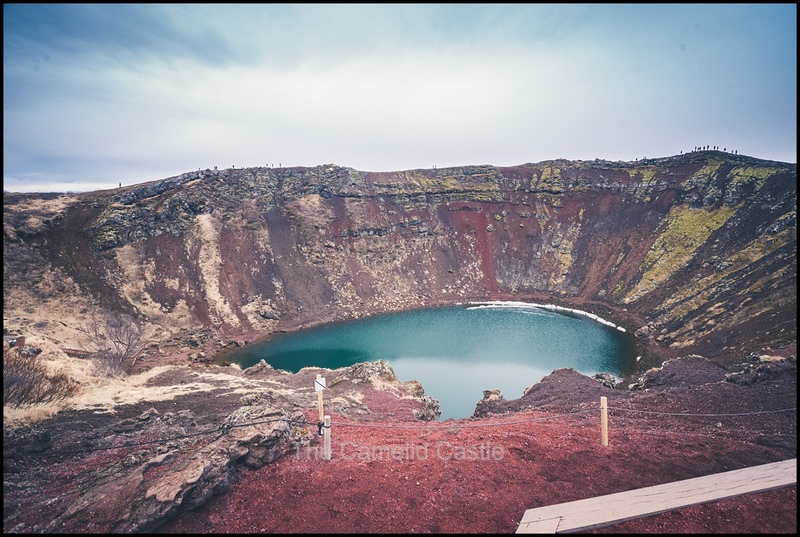 It is one of several crater lakes in the area, known as Iceland’s Western Volcanic Zone, which includes the Reykjanes peninsula and the Langjökull Glacier. 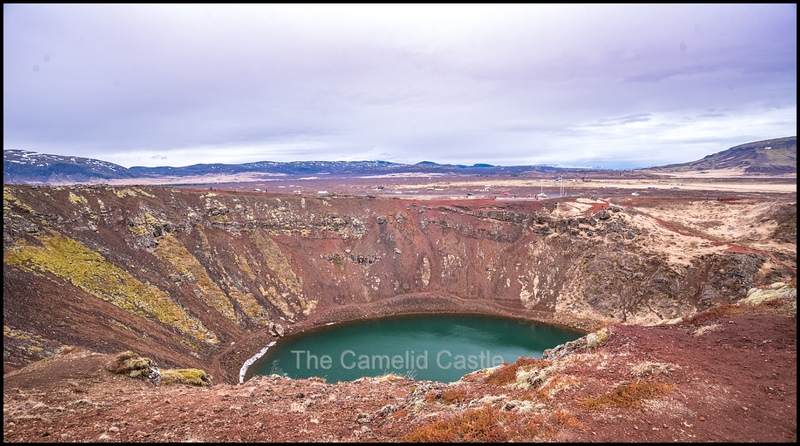 Kerið Crater was approximately a 35 minute drive from our camp. 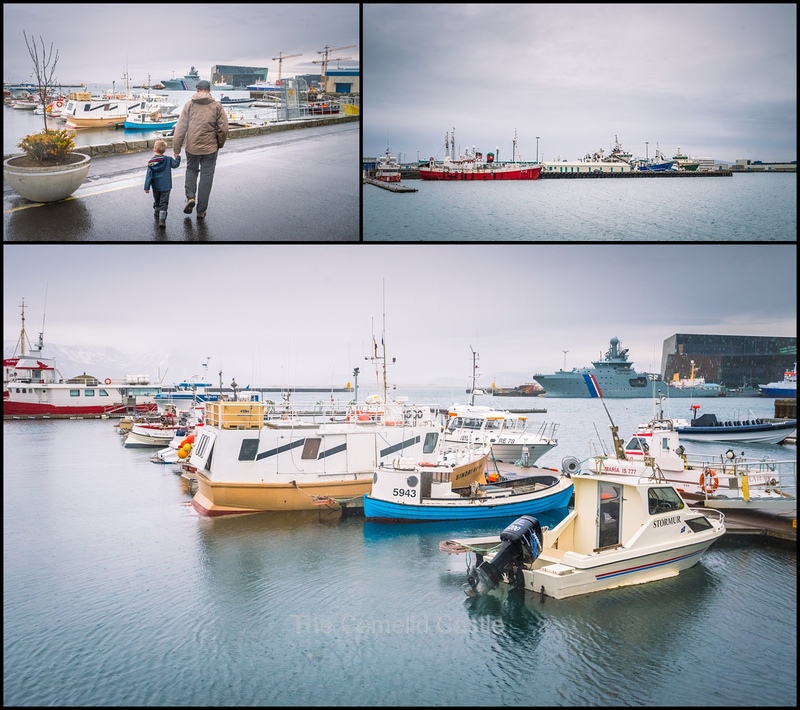 Unlike the sunny days we had early in our Iceland adventure, it was another mostly cloudy day, but the temperatures were quite mild. 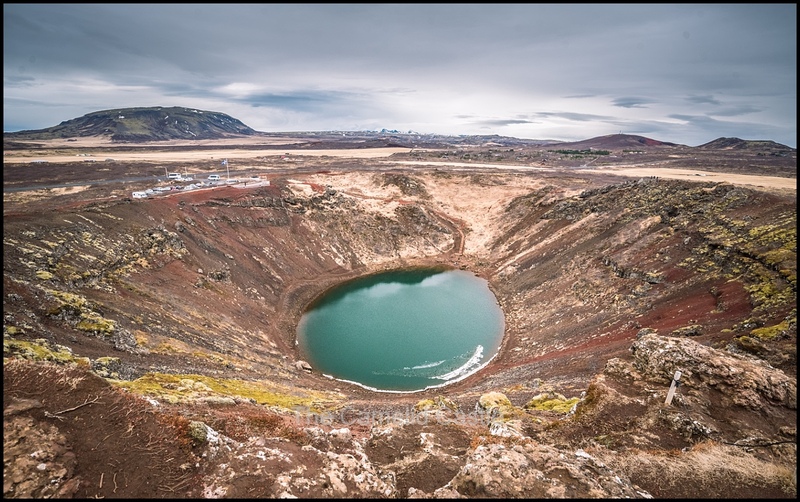 During our 9 days in Iceland, we’d seen a few craters. 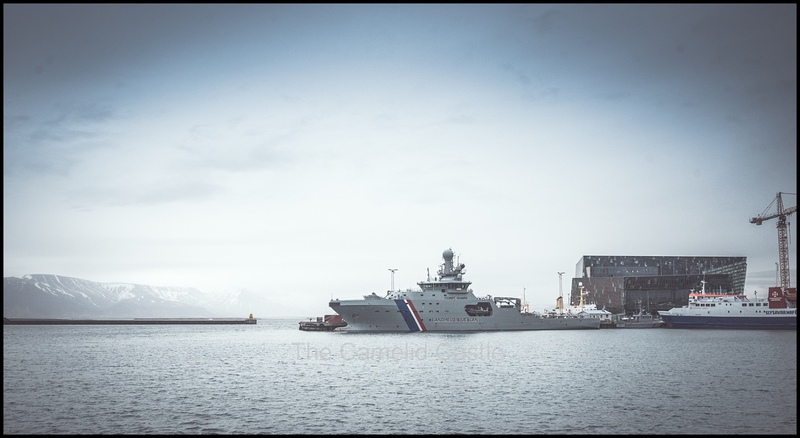 As we approached Kerið it didn’t look as big or impressive, but once we parked and walked up the size was somewhat surprising. The crater, like the other volcanic rock in the area, is composed of a red (rather than black) volcanic rock. 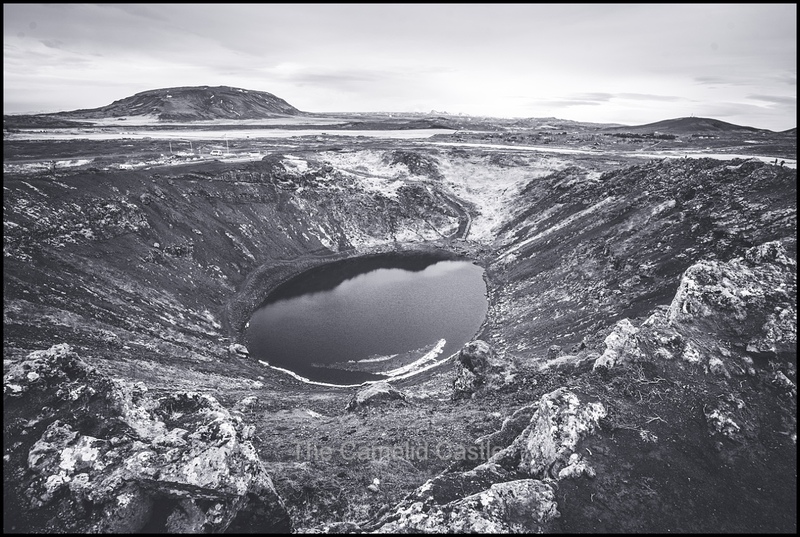 The caldera itself is approximately 55 m deep, 170 m wide, and 270 m across. Unlike all the other craters we had visited thus far, this one had a (small) admission fee. The South of Iceland is definitely figuring out they can make money from tourists! There were the last few traces of snow around the bottom of the crater and unlike all the other craters we had visited, the water in the bottom of this one was (mostly) defrosted. The lake itself is fairly shallow (7–14 metres, depending on rainfall and other factors), but due to minerals from the soil, is an opaque and strikingly vivid aquamarine. It was extremely windy and the wind was icy, making the walk around a little unpleasant. As usual for Iceland there were no guard rails and the drop was somewhat terrifying with the kids. They were good at holding hands luckily! It didn’t take too long to circumnavigate the crater, watching the ant-sized tourists at the other side at any point. You can walk down to the lake on a marked (but rocky) trail on the least steep side but given the wind we decided to just do the circuit around the top and head to our next stop. This was pretty much the first non-snow encrusted crater we had managed to see. Despite being crawling with tourists it was definitely worth the visit. 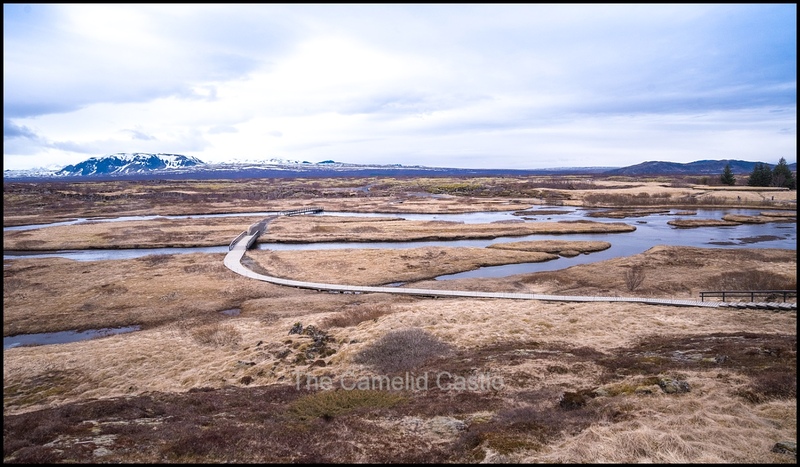 Next on the agenda was the Thingvellir National Park, one of the main attractions on the is a Golden Circle route. It has been a National Park in Iceland since 1930 and was named a World Heritage site by UNESCO in 2004. It was approximately another 35 minute drive from the crater to the national park. The scenery was again quite different in this area, lots of mossy grass growing on dark volcanic soils. The horizon was still dotted with hills and mountains, most still covered in at least some snow! 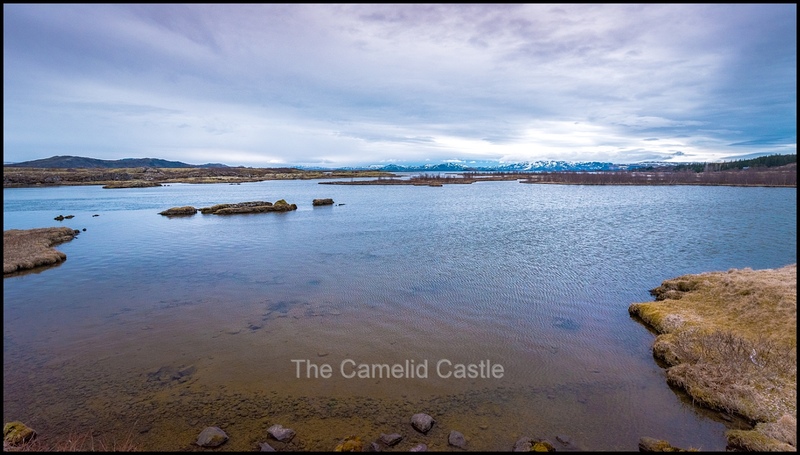 Thingvellir National Park is a little over 9 hectares and contains quite a number of attractions. We first headed for the information centre to see they had useful maps to help us plan some hikes and the order of attractions. unfortunately it was full of tour buses and tourists using the toilets, and not much else so we decided to go back to using good old google maps and do our own thing. Entry to the Park is free, although you do have to pay for parking in all of the car parks. We followed some signs to the first set of car parks, which seemed to be the area we wanted to be in. We first spotted the The 20m Oxararfoss Waterfall, but the kids firmly told us that they did not want to see another waterfall! While it looked like it might be pretty, we were also suffering from a bit of waterfall fatigue so agreed to go first to see the mid-Atlantic ridge. Our first stop was a hike up to the viewing area to see the mid-Atlantic ridge. 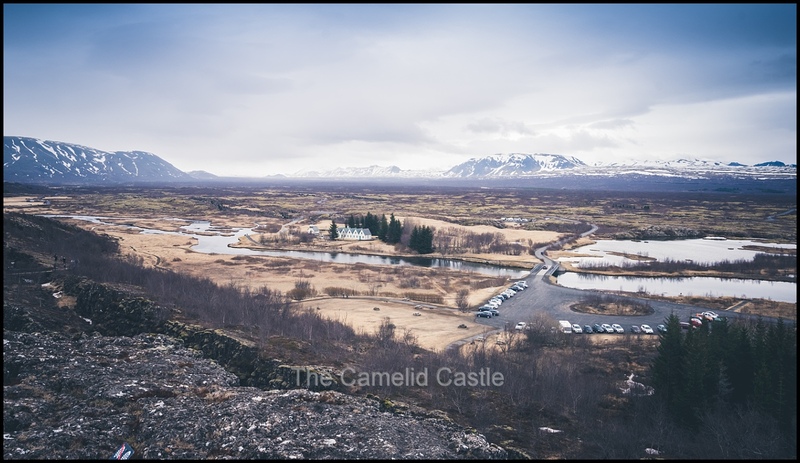 Thingvellir is notable for its unusual tectonic and volcanic environment in a rift valley. The continental drift can clearly be seen in the cracks or faults which traverse the region. Park rangers pointed out where many of the fissures had opened up due to the North-American plate being higher than the sinking Eurasian plate. The plates are being pulled apart at a rate of about 2cm a year. 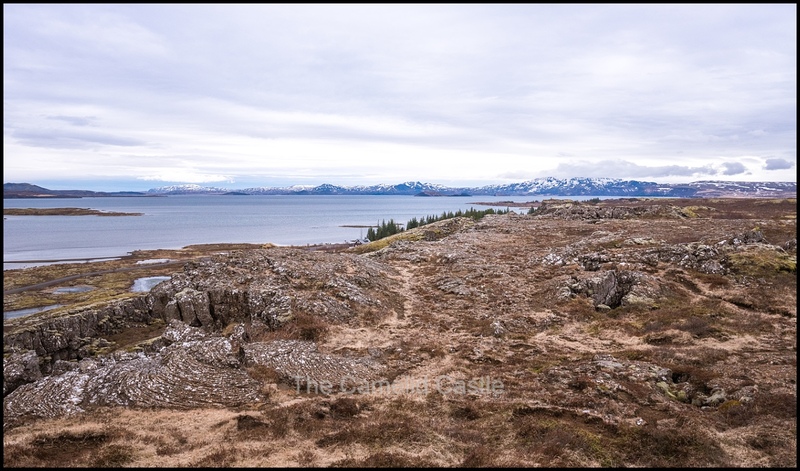 It is pretty cool seeing where 2 tectonic plates meet, Iceland would be a geologists dream! It isn’t bad for photographers either, the views were pretty impressive. Next on the agenda was a visit to the ‘Law Rock’. When Viking settlers arrived in the 10th century it was the site they chose as the meeting place of Althingi, the world’s oldest parliament. It is a little bit in the middle of nowhere, but the unique geology created a natural amphitheater perfect for public speaking including the high rock wall of Logberg (Law Rock). Here the laws of the land would be recited from memory. The parliament’s members, godar, discussed and decided new laws and passed on judgments in Althing. All the area we were walking around had marked trails, steps and board walks, so it was pretty easy walking. There was plenty of water everywhere so we had to take quite a walk sometimes to get to our next spot, luckily the scenery was pretty good. Every year the parliament would assemble for 2 weeks and originally there were no permanent building so people would make grass huts, and use stones and home-spun cloth for shelter. Later a church and farm were built and a Summer residence for the Prime Minister (which is still in use). 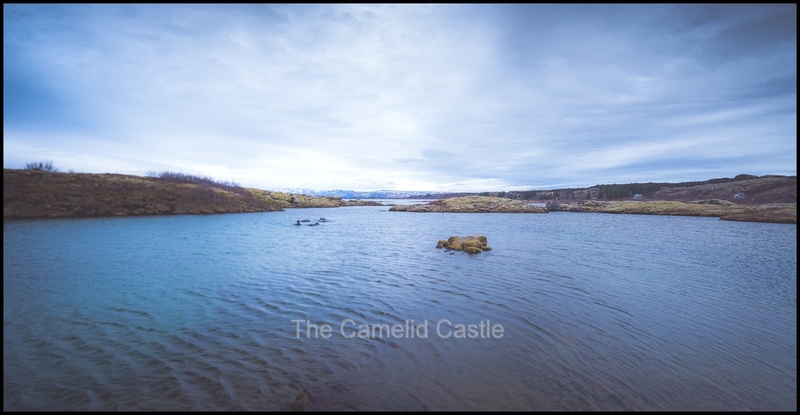 Lake Thingvallavatn is the largest natural lake in Iceland. Lava fields stretches into the lake from the north and there are many fissuers in the lava. It was rather pretty on a cloudy day! 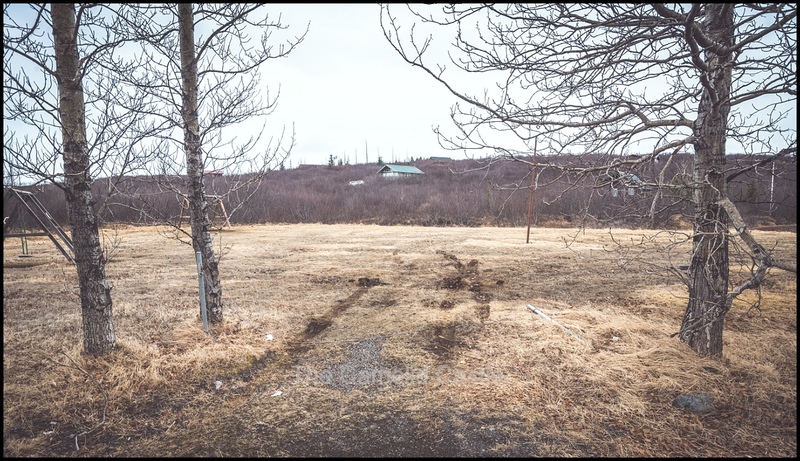 By the time we finished in the Park it was well and truly lunch time so decided to stay where we were and cook some food in the motor home before making the drive into Reykjavik. It was to be our last meal in the motor home and ended up being an assortment of fridge leftovers, including salad and toasted sandwiches, and boiled eggs. Groceries cost a fortune but we had made all bar 1 meal so far in the motor home and we had been eating quite well, even if our meals were quite basic. Considering a basic plain pre-made sandwich and a drink for us all would cost at least $60AUD glad we were making our food! On the trip into Reykjavik both kids rested. It was 3pm when we arrived at the harbour area and raining. 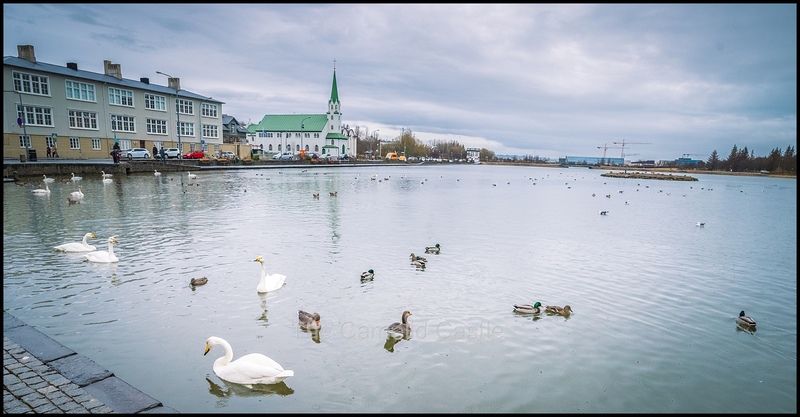 Reykjavik is located on the Southern shore of Faxa Bay. We had heard that parking in the city area was a bit of a nightmare but found a park right on the harbour and exited the motor home into some cold and sleety rain. We had no real plan but headed for the colourful buildings in the old town area and hit up some souvenir shops, to pick up a few last-minute items. We found plenty of street art (including trolls) and large poles venting steam from the ground! Reykjavik actually reminded us a lot of Helsinki in architecture and the buildings. It is quite different from Stockholm and Copenhagen. At a latitude of 64°08′ N it is the word’s most Northern Capital city! 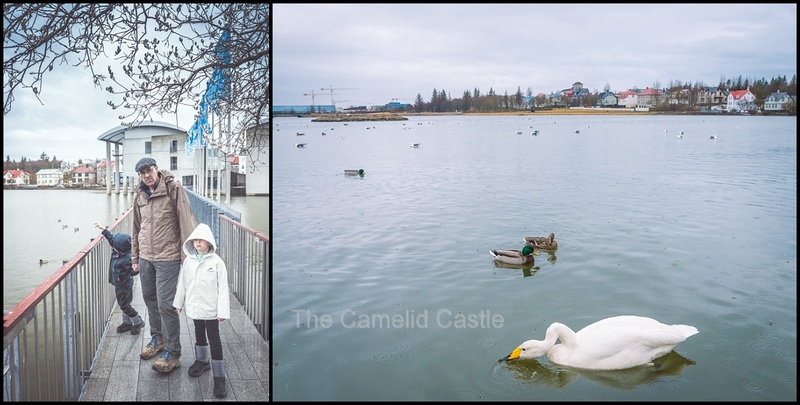 Like all European cities (seemingly) there was a lake populated with white swans, it wasn’t the weather for sitting around admiring them though…….. In our wander through the old town we spied plenty of places that looked like they were serving hot coffee and yummy cake, but we didn’t have long until we had to drop the motor home back, so kept on moving. 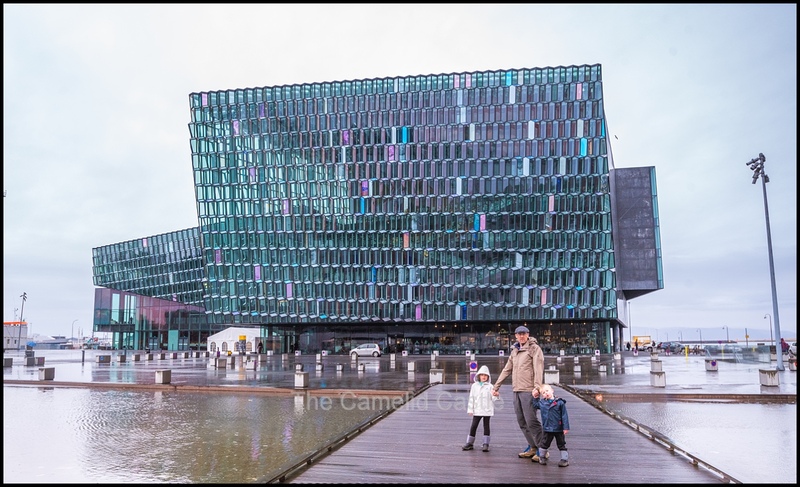 The Harpa building (a concert hall and conference centre) is one of the more distinctive building on the harbour and was worth checking out. It was opened in 2011 and the glass facade shimmers different colours. Even though it was a rather grey day it was still pretty. Our final stop was the Sun Voyager, a sculpture by Jón Gunnar Árnason, located next to the Sæbraut road on the harbour. 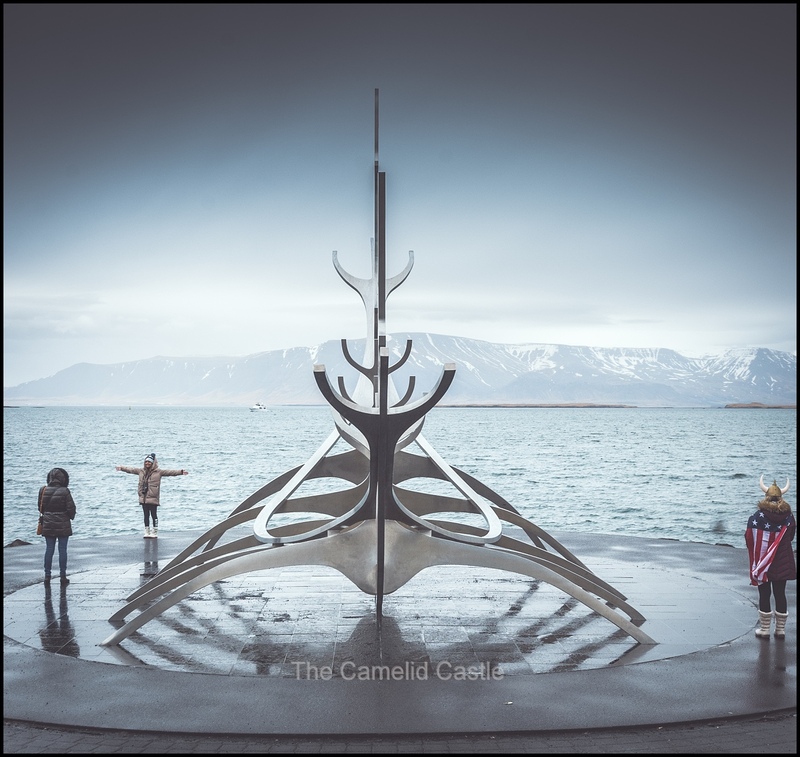 Sun Voyager is described as a dreamboat, or an ode to the sun. The artist intended it to convey the promise of undiscovered territory, a dream of hope, progress and freedom. 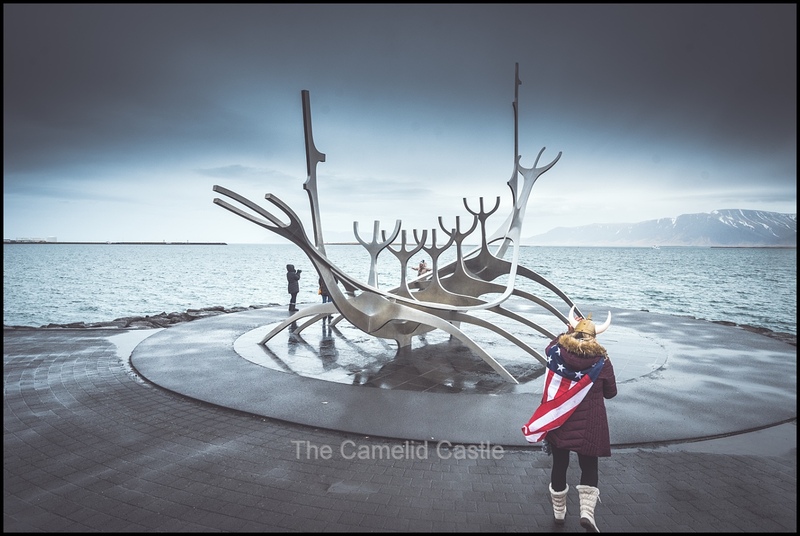 It was not particularly sunny but it did look dramatic against the stormy skies and had a viking posing for a picture of his own! We were now all officially cold and wet and the rain was coming down quite hard. 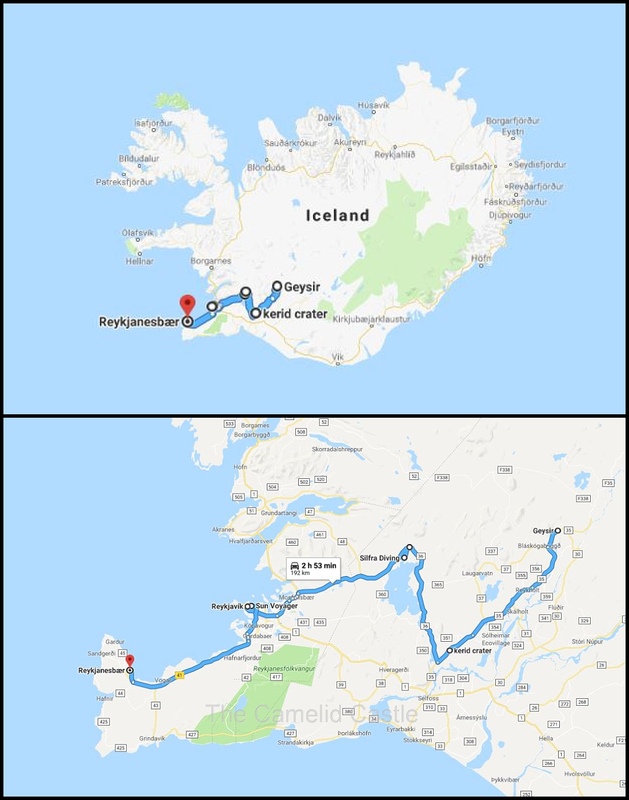 It was the final stop for the motor home and we did a final fill with diesel and drove back to Thorgils house, about 20 minutes outside of Reykajvik. It felt like a million years since we’d picked up the motor home from him 9.5 days earlier. We had most definitely had some amazing adventure in that time. We picked up the luggage he’d been storing for us and emptied all of our bits and pieces out of the motor home, hopefully locating all the items we had stashed in weird locations. It was then time to bid our home for the last 9 days farewell and we loaded ourselves and our luggage into Thorgils Jeep as he drove us to Keflavik, where we were staying at an airport hotel (the Bed and Breakfast Keflavik Airport) for the night as the Keflavik airport is an hours drive from Reykjavik and we had an early flight the next day. The hotel is on a former NATO base and looks rather uninspiring from the front but was quite nice on the inside, and well priced for an Iceland hotel. It also included a free shuttle to the airport which was 4km away, and breakfast. It was already 6.30pm and we were all exhausted so we went to nearby American style diner for dinner. It was only our second meal out in Iceland and we were just grateful to not be eating pasta tonight. While it was far from gourmet it was too awfully priced for Iceland food. As is typical for an American style diner, the meals were huge. 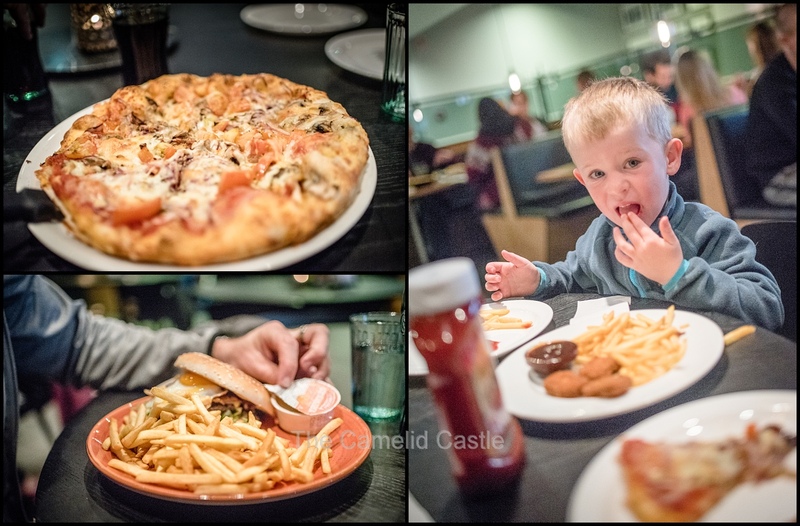 We ended up with a veggie pizza, a burger and chips and one kids meal of nuggets and chips and it was only $80 AUD. At this stage of our trip we thought that was quite reasonable especially since it was plenty of food. We didn’t even want to add up how much money we’d spent on food and diesel during our 9 days in Iceland. Luckily the memories were priceless! The kids rather tired, and all full of fried food, we walked back to hotel and enjoyed a very long shower with hot water. We all marvelled at the ability to walk around without turning sideways and being able to flush the toilet whenever we wanted! 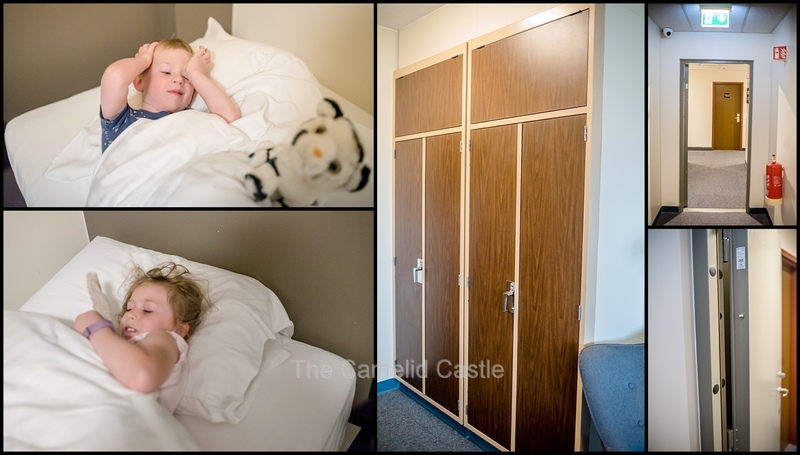 Unfortunately for us the adults could not make good use of the beds as we had to re-pack for our morning flight after everything from the motor home had been randomly shoved into the nearest bag in the interests of getting to the airport. 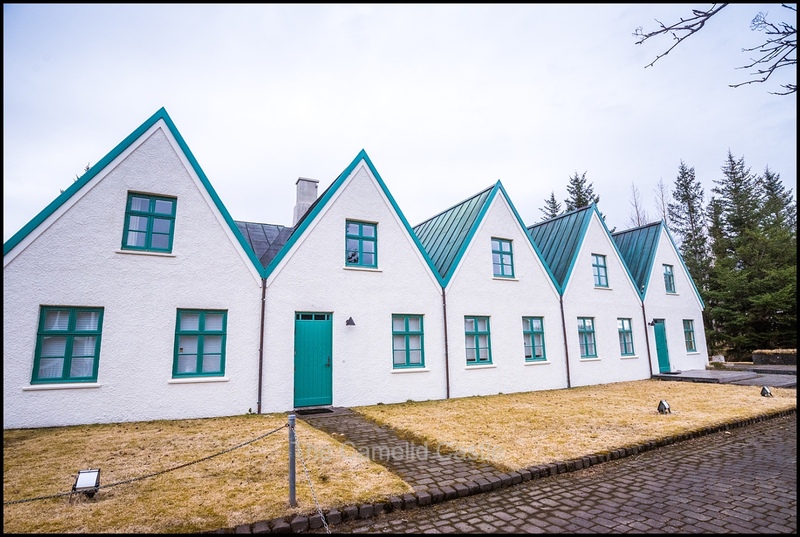 With things vaguely sorted out and all our bags under their weight limits (we had not been able to afford to do a lot of shopping in Iceland) we hit those comfy bed for a good nights sleep stretched out in comfort, enjoying the fact that we weren’t moving around in the wind! Daily statistics for Saturday the 14th of April 2018 in the South of Iceland and the Reykjavik area – The day started out at 6 degrees (with an apparent temperature of 3 degrees) and windy. 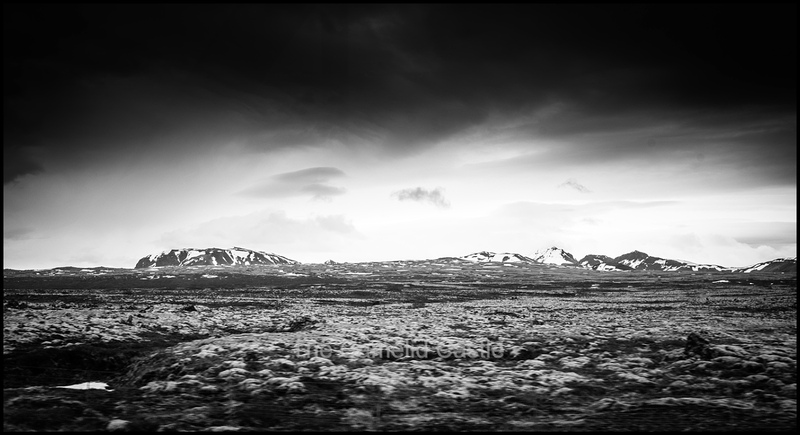 During our time at Thingvellir it was 7 degrees with an apparent temperature of 4, cloudy and windy. 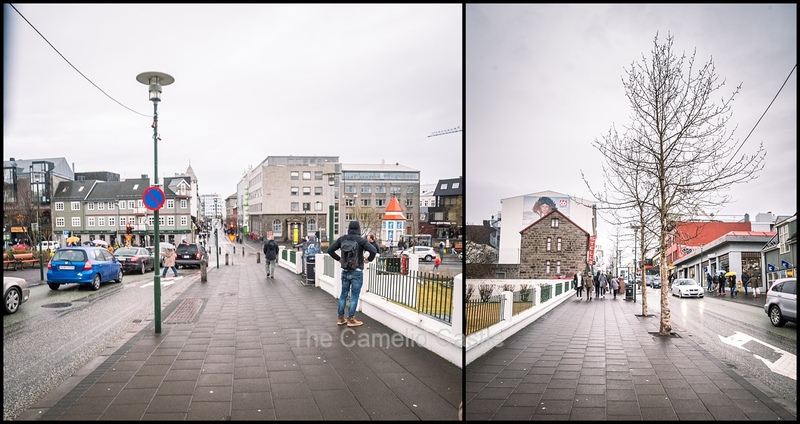 The temperature in nearby Reykjavik in the afternoon was identical but with rain and 30km/h winds, making it rather unpleasant! The total walking for the day was a sizable 11.35km, with plenty of walking around craters, the National Park and Reykjavik. Our total driving for the day was around 200km, broken up into lots of short sections, but still around 3.5 hours of driving time. Here is our map for the day, completing our trip circumnavigating Iceland in 9 days! 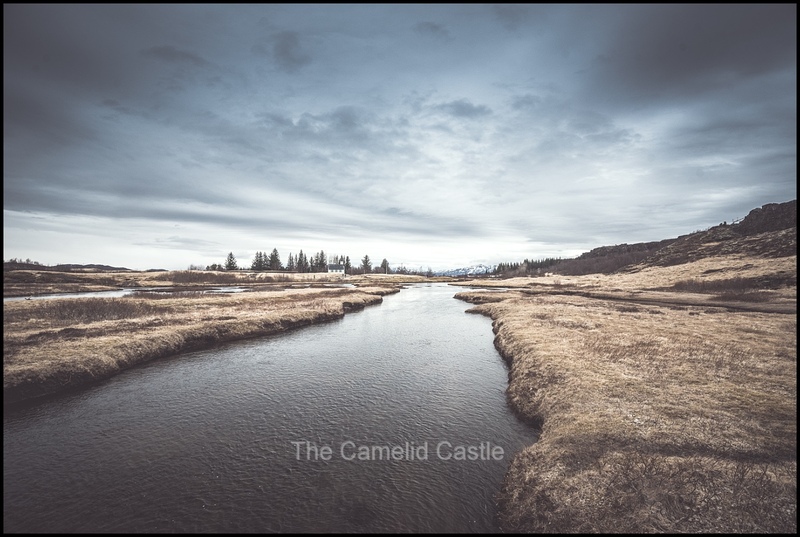 Up next – it was farewell Iceland as we flew South to Scotland, spending the day in Edinburgh, checking out Edinburgh Castle, the Royal Mile and the Old Town before heading to Glasgow for Anto’s week of work and some down time for the kids and I. Plenty of posts featuring Scottish food and countryside coming up over the next month! 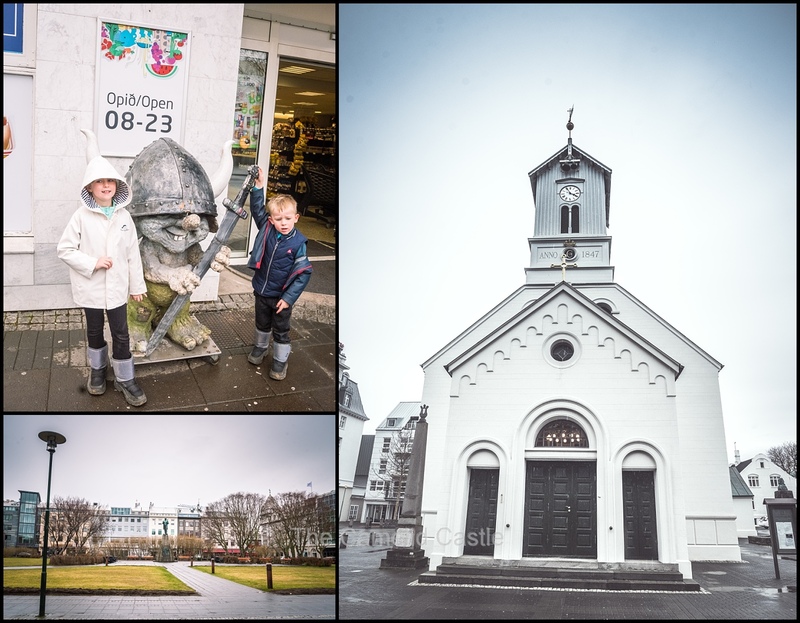 Posted in 4 years, 6 years, Anto, Astrid, crater, Europe, Golden Circle, Iceland, Iceland in a motor home, Keflavik, Kerið Crater, kids, mid-Atlantic ridge, Reykjavik, Silfra Fissure, Soren, Thingvellir National Park, Travel, travelling with kids, waterfallBookmark the permalink.